To those of you diehard fans of the TV series (and the book series too) of Game of Thrones, I offer you my humble devotion. Before you play, I highly recommend you to see the actual battle scene from the TV series just so you can get a glimpse of what's going on. There are AI files and SOUND files so please do put them into the right folders before you play. It will vitalize the game beyond imagination. Suggested game speed is normal. Please enjoy and do not hesitate to provide feedbacks as I would very much appreciate it. 'Game of Thrones - Battle of the Blackwater (299 AC)' by jaj564 is a single player scenario depicting the infamous siege from Game of Thrones, pitting the powerful Baratheon invasion fleet against the dwarf Tyrion Lannister and a small group of defenders. The player must defend from the limitless Baratheon forces for a total of fifteen minutes, while keeping Tyrion Lannister alive. 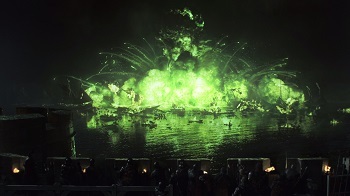 SUGGESTIONS: Stannis' forces often get sidetracked attacking the walls of King's Landing, and it would be wise to make player 4 allied to player 3 to prevent this from happening - unless of course it is an effect you want. As for the map design, it is good but the square elevation formations on the beach look odd and could be tweaked to make them look more natural. Rotate the craters outside the main gate so they're more random rather than the uniform rotation that you've used. CONCLUSION: This really isn't that bad of an effort but it isn't anything exceptional either. The author has clearly done well with what's in the scenario currently, but more is needed to make it a good scenario. In a sentence - A fun way to spend 15 minutes and not much else. In closing - I recommend this download to FF and DtS enthusiasts.